My Reindeer at home does not have a red nose but he is still very cute :) When I was a kid my Dad used to sing Rudolph The Red Nosed Reindeer to me all the time! Now he sings it for my kids. My four year old loves the song and giggles every time he sings it for her :) We all have a few special songs we loved as a child. I still smile, and sing along when I hear this song :) I would love to hear about some of your favorite songs as a child? My Reindeer at home is here to wish you a Happy Friday and a lovely weekend! I love Rudolph! 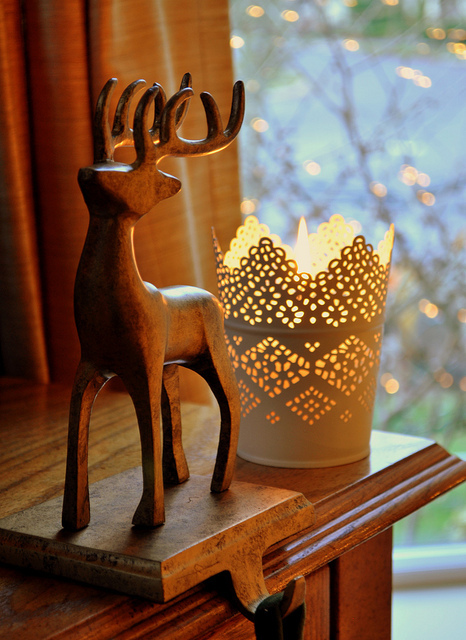 That lacy container behind Rudolph is gorgeous!